Most of our sea and coastal trips take place along the south coast, though you might find the occasional trip overseas! If you want to join us but have never paddled on open water before, contact the event organisers to find out what level of paddling will be required. Sea paddle – rescue practice.. Meeting at 10.00. On the water at 10.30. Get in touch with Rick if you want to find out more. 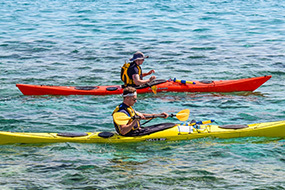 Rick tells us ‘4 of us have signed up with Fluid Adventures to do a trip to the Isle of Wight and back on the 29th June, whilst the max size of group is 4 they can run more than 1 group, there is a 3 star paddling criteria and ability to do 25k, It would be nice just to get it out there so people can be aware of the options.’ Get in touch with Rick if you want to find out more. Sea paddle from Littlehampton to Arun and back. Meeting at 10.30. On the water at 11.30. Get in touch with Rick if you want to find out more. CAR PARK has 2.06m HEIGHT BARRIER. Sea paddle from Keyhaven to Lymington and back. Meeting at 10.30. On the water at 11.30. Get in touch with Rick if you want to find out more. Get in touch with Rick if you want to find out more as it may be possible to add a second group.